Sandwiches in Tennessee are best served on one of the state&apos;s most celebrated foods, the biscuit. This humble version of bread became popular just before the Civil War, when yeast was expensive so cooks made do without it. A firmer texture than a traditional slice of bread makes the biscuit perfect vehicle for gravy, among other toppings. There are as many versions of the biscuit sandwich in Tennessee as there are places serving them. Popular fillings include eggs and ham, fried chicken and barbecue pork, but the best thing about this versatile sandwich is you can stuff it with almost anything. 10Best and Sandwich America set out to find the best biscuit sandwich in the state, and to do so, 10Best editors joined forces with a panel of local Tennessee food writers and The Food Channel to nominate 20 worthy restaurants across the state. 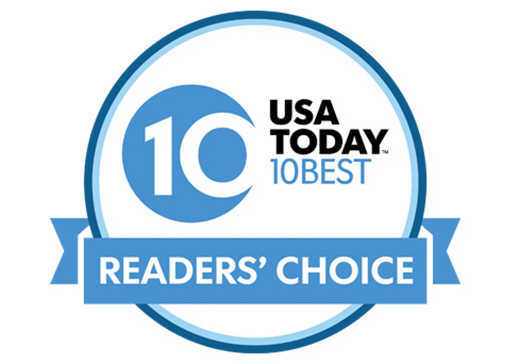 For the past four weeks, our readers have been casting ballots for their favorites. The biscuit sandwich menu at Chattanooga&apos;s Bluegrass Grill includes just about any combination of bacon, sausage, ham, eggs and cheese inside half whole wheat, half white flour biscuits. 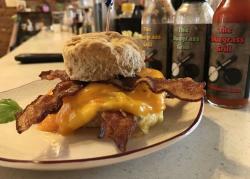 At Niedlov&apos;s Breadworks in Chattanooga, guests can choose the a breakfast biscuit with sausage or bacon, egg and cheddar cheese, or opt for The Fancy, a homemade biscuit with a fried egg, bacon, arugula, cheddar cheese, avocado, red onion and jalapeño aioli. Diners at the Mean Mug Coffeehouse in Chattanooga have a couple of biscuit sandwiches to choose from. The Prosciutto Biscuit comes with prosciutto, tomato, provolone and mashed avocado, while the Breakfast Biscuit has American cheese, egg and bacon. A guest favorite at Maple Street Biscuit Company in Chattanooga is the Squawking Goat – a flaky biscuit filled with all-natural fried chicken breast, panko-breaded fried goat cheese and a house-made pepper jelly. At Milk & Honey in Chattanooga, the Farmhouse Biscuit is served with house-made breakfast sausage, Benton&apos;s bacon, egg, tomato jam, arugula, white cheddar, shallots and caramelized onions. The Mega Biscuit includes breakfast sausage, spinach, egg, roasted red pepper spread, white cheddar, caramelized onions and shallots. Congratulations to all these winning sandwich shops and restaurants!